Great news for Oppo-lovers! The much-hyped Oppo N3 and R5 are now available for pre-order! Both the phones have exclusive features which might nudge you to ditch your old phones and give one of these a modest try. The Oppo N3 comes with the infamous swiveling, 16-megapixel camera; and of course there is the sensor for taking photos and fingerprint security to go with it. This dual-SIM supported phone has a 5.5-inch screen and runs on Snapdragon chipset and Android 4.4.4 Kitkat. To learn more about the phone, read our hands-on-review here (video review is included). The R5, on the other hand, claims to be the thinnest phone out there, and is only 4.85mm thick. The phone has an amazing, full HD display of 5.2 inches, and it runs on Android 4.4.4 Kitkat. The camera of the phone is not as high-profile as Oppo N3, but it still has a 13-megapixel camera with Sony Exmor IMX214 BSI sensor, which is bound to give great performance. To learn more about the phone, read our hands-on-review here (video review is included). Oppo has started taking pre-orders from January 8, 2014. The price of Oppo N3 has been decided at BDT 54,800 and the price of Oppo R5 has been decided at BDT 39,900. Along with that, upon placing an order, you will get an Oppo Bluetooth Headphone (price: BDT 4,500) delivered to you with your phone absolutely FREE! 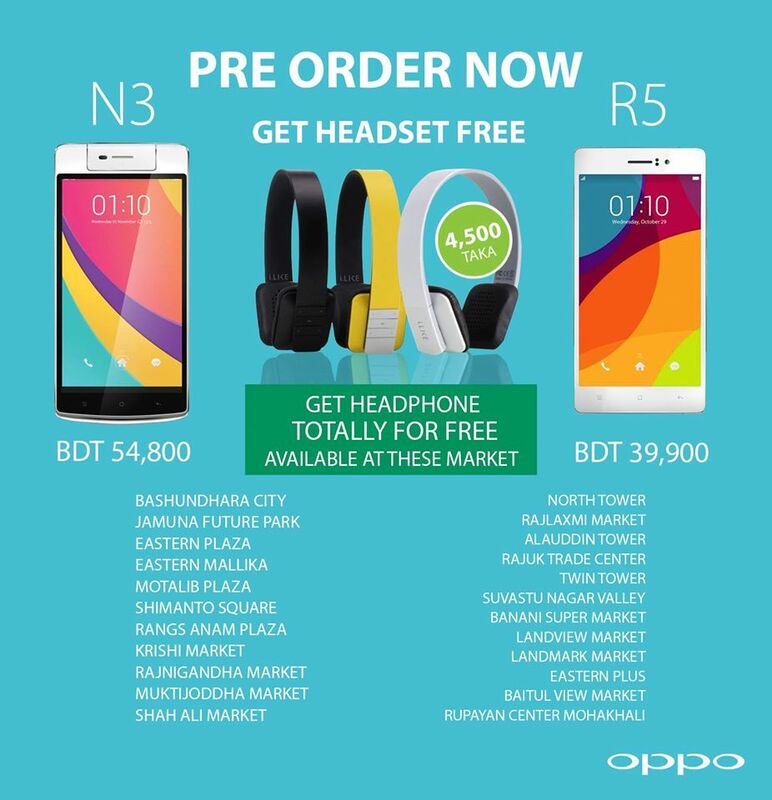 Oppo will be taking orders only till January 22, 2015. So, what are you waiting for? Visit any of the locations mentioned below and place your order for you favorite Oppo phone! Note: Currently, orders are only being taken at the following outlets of Dhaka. People living outside of Dhaka might have to wait longer for the pre-order facilities to be available at their cities. For any inquiries, please visit the official Facebook page of Oppo Bangladesh.